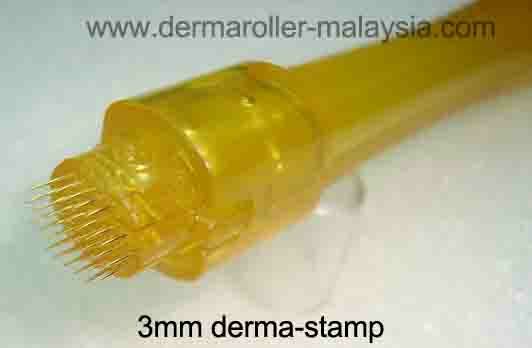 A small 35 needles dermastamp with titanium alloy steel needles (the size of the needle plate is similar to a fingertip). This is perfect skin needling tool to treat isolated scars and other hard to reach areas (deep lines around lips, between eyebrows, etc). 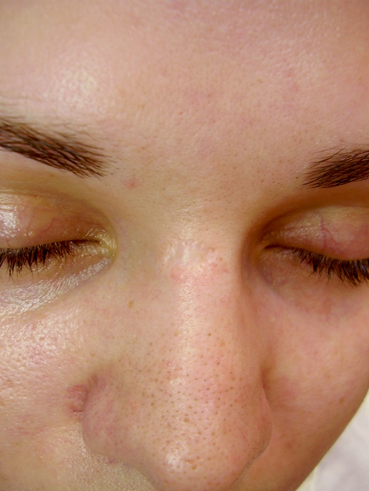 The process for removing scars is simple, generally painless and all up a very quick process. 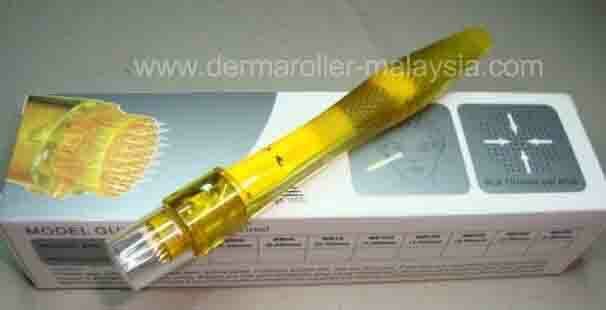 You stamp the scar about ten times with the sterilized derma stamp, this takes a few minutes and that's it. After 4-6 weeks you stamp again and possibly a third time, 4-6 weeks after that. Generally two treatments are enough. The stamp lasts for several treatments depending on how large the area is to be treated. 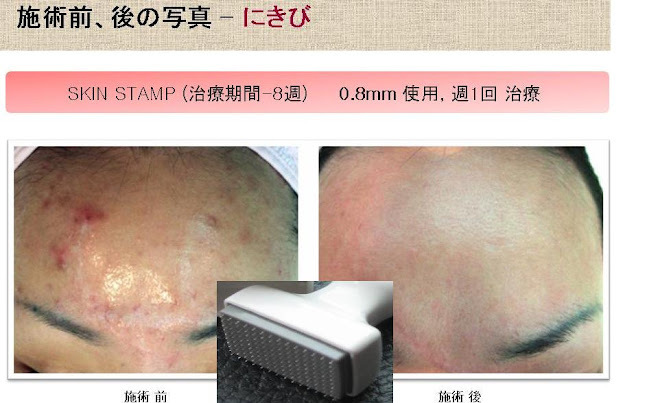 The Micro Needling Skin Stamp Stamp breaks down the old collagen fibres, and then time must be allowed for the new collagen to grow and fill in the scar. 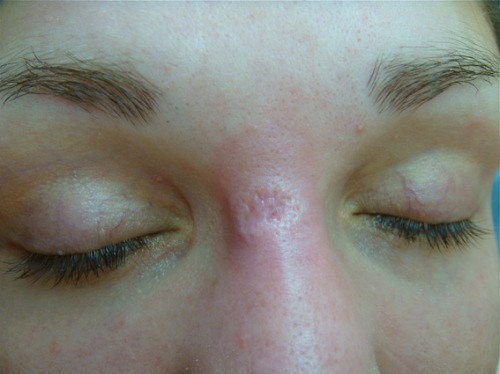 The area will be red after treatment but there should be no down time and no post application pain. Dermastamp is securely packed in plastic tube and needles are protected with a special cover so you can store the stamp in a cosmetic bag or anywhere away from reach of children. 10. The security natural, easy easy to see instant changes in the skin. 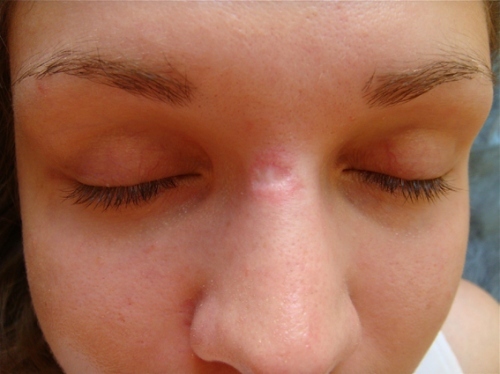 We are confident that the scar will improve by 80 to 90% with another 1 or 2 treatments. Please choose the size of needles length : 0.20mm or 0.25mm or 0.30mm or 0.50mm or 0.75mm or 1.00mm or 1.50mm or 2.00mm or 2.50mm or 3.00mm. If you want to COD, you can meet met at Aeon Mall which is Oposite Tesco Alma at Bukit Mertajam for free of charge. Or pay me rm7 car petrol if you want to meet me at Auto City Penang. Or you can go bank in RM75 / RM80 to my bank account, then sms me (016-4833944) or msn/email (2aek@live.com.my) to tell me that you already paid money to buy Derma-stamp, tell me your name and house address.